The Mycoplasma and Chlamydia Infections in Humans unit is a Research Unit approved by INRA (Unit under contract – USC) and Bordeaux University (Host Team – EA). Internationally renowned for its expertise in the field of human mycoplasma infections for over twenty-five years, it is a member of the TransBioMed Research Federation at Bordeaux University. Recognised by the Ministry of Health and Public Health France as a National Centre of Reference (CNR) on Chlamydia from 1999 to 2016, it has just been appointed as coordinating laboratory of the French CNR on bacterial Sexually Transmitted Infections (STI) from 2017 to 2021. It has a strong partnership with the Bordeaux Teaching Hospital; the unit’s lecturer-researchers are all hospital academics working in the fields of clinical microbiology, infectiology or rheumatology. The aim of the unit is to develop translational research in clinical microbiology on mycoplasma and chlamydia infections in humans. These bacteria have several characteristics in common. They are responsible for infections of the genital tract and of the respiratory tract and can be involved in chronic diseases such as asthma. Our aim is to improve understanding of the role of these bacteria to increase knowledge on their epidemiology and improve the methods of diagnosis and treatment of the infections they cause. Comparative genomics of human mycoplasmas for two pathogenic species: Mycoplasma pneumoniae responsible for respiratory tract infections and Mycoplasma hominis responsible for urogenital and neonatal infections. Host-mycoplasma interactions, particularly the interaction of M. hominis with the innate immune system in humans. Epidemiology and diagnosis of mycoplasma and C. trachomatis infections: molecular diagnosis, molecular typing methods, antibiotic susceptibility testing, acquired resistance to antibiotics and epidemiological studies on C. trachomatis, M. pneumoniae, Mycoplasma genitalium, M. hominis, and Ureaplasma spp. infections. This scientific area includes the research activities of the CNR on bacterial STI caused by C. trachomatis and urogenital mycoplasmas. Within Bordeaux University, IHMC collaborates closely with the UMR 1332 (mollicutes team) in the field of mycoplasmas. It also collaborates with the UMR CNRS 5164, Bordeaux Functional Genomics Centre (CGFB), and Bordeaux Bioinformatics Centre (CBiB). National Collaborations: ENVT (UMR INRA 1225), Anses Lyon, Anses Maison Alfort, CEA-Génoscope Evry, CEA Fontenay-aux-Roses, Caen University Hospital, Limoges University Hospital, APHP Hospital Saint-Louis, Paris-Orsay University, Institut Pasteur and Versailles-Saint Quentin University. International Collaborations: Statens Serum Institut, Denmark; University of Dresden, Germany; Hebrew University of Jerusalem, Israel; VU University Medical Centre, University of Maastricht, The Netherlands; Kitasato University, Sapporo Tokushukai Hospital, Japan; Centre for Genomic Regulation (CGR), Spain; Anova Health Institute, South Africa; Uppsala University Hospital, Sweden; Centre National de Greffe de Moelle Osseuse, Tunisia; Health Protection Agency, University of St Andrews, University of Southampton, the United Kingdom; University of Alabama in Birmingham, University of Washington in Seattle, Mayo clinic in Rochester, USA. The unit has been coordinating the study group on human mycoplasmas (ESGMI) of the European Society of Microbiology and Infectious Diseases (ESCMID) since 2013. This group aims to study and improve the diagnosis, treatment, control, and prevention of mycoplasma infections in humans. 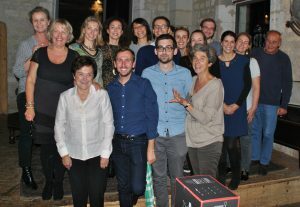 Through the bacterial STI CNR, the unit is a major partner of the i-Share cohort project (Initiative of excellence, IDEX Bordeaux) on sexually transmitted diseases conducted by the INSERM U657 unit, Institut Pasteur/Versailles-Saint Quentin University (www.i-share.fr). This project consists of a clinical trial to evaluate the efficacy of early screening of Chlamydia trachomatis infections and treatment in young students in several French universities to prevent pelvic inflammatory disease with risk of sterility caused by this microorganism.